Newbie chicken owners, BEWARE! Raising chickens will be more than you bargained for. Be prepared for your life to go a little sideways…and to stay that way forever! It will change you in ways you couldn’t possibly anticipate. (And all for the better). Some of my first babies, the day I brought them home. They seem innocent enough, don’t they? Peeping cute chicks, small enough for several to fit in your hand. So small, in fact, who would suspect they have the power to change a human perception (and possibly even a way of life)? Here’s how it happens. Newbie chicken owners, beware! It sneaks up on you and before you know it, life has changed. And there’s no turning back. There were the times when I’d come in and look into the brooder at sleeping babies and panic that one was dead (she never was). Or times when I had to take a Q-tip and gently moisten and remove the blob of poop from a chick’s backside to keep her from ‘stopping up’ (and then dying). They have to be kept warm but not too warm. And not too cold, either. They were so fragile (it seemed) and so cute, they won my heart instantly. They will do the same to you, trust me. I don’t think there’s a cure for this. I remember, too, waiting and waiting for that first egg. Although the chicks grew at rates to rival any Guinness World Record, waiting those six months for an egg seemed excruciatingly long at the time. A. VERY. LONG. TIME. 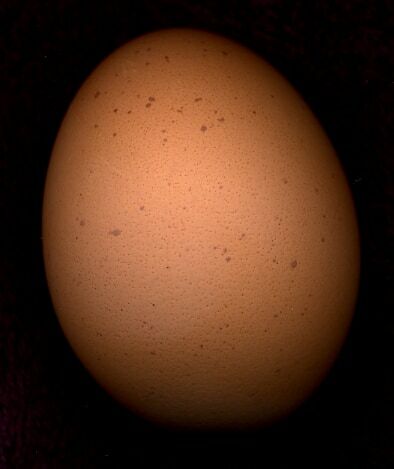 But then one day, out in the nest box, a tiny pinkish-brown egg-shaped gem. Smaller than the white, generic store eggs (they got bigger over time), this perfectly shaped lovely creamy brown egg made the wait worth it. I felt like throwing a party and inviting all the neighbors and friends. Six months (and sometimes longer) of tending and raising and feeding and worrying and caring for a living creature to finally get a SMALL egg. And in that moment, we change. That egg represents countless hours, some cash, and a lot of waiting. It’s not the same thing as running down to the grocery store and buying eggs. This tending and waiting brings food into a new focus. For many people, raising backyard chickens is a way to take a tiny piece of control over their food. We’ve all seen too many images of those suffering hens, stuck in wire cages on top of each other, laying eggs without being able to move around. We’ve all heard scary reports about how commercial eggs are laced with arsenic or salmonella or other varieties of not-good-for-you-stuff (I had a friend who cracked open one store-bought egg and it was full of MOLD inside–ewww). And frankly, many of us are tired of it. 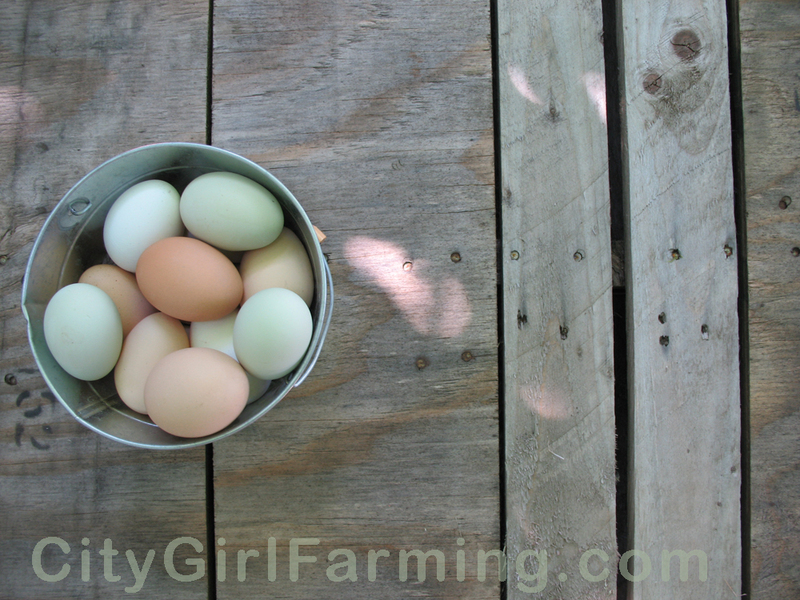 One tiny step towards self-sufficiency starts with your own small flock of hens who will give you 2-6 eggs per week in their prime. Beautiful, glorious eggs in an amazing variety of colors and subtle variations of hues. Eggs that are better for you, too. Full of more beta carotene, vitamins A and E, and omega 3’s, while containing less cholesterol and saturated fat than their boring, white, generic store counterparts. And they taste better too! Although I could go on and on (and sometimes do, here’s 20 reasons why you should raise chickens. ) about the benefits of chicken ownership, this week, when I was thinking about you newbies out there, watching your cute babies grow and waiting for your first eggs, I was thinking about the miracle of the egg. BC (Before Chickens), eggs were a dime a dozen (well, maybe not that cheap, but you get the point). If I needed some, I went to the store and bought them. But having chickens completely spun me around. Each day, even now after years of this, when I collect the eggs out of the nests, I’m in awe of the preciousness of each egg. It took raising a baby chick up for six months to get that first egg. And building a coop that almost killed me in the process (but that’s a story for another day). It’s doting and tending and feeding. And taking care of them when they’re sick. It’s monitoring the dog and chicken recess times so they’re not out together (and then building a fence to simplify everything). It’s shoveling pounds and pounds of poop, gathering fresh berries for hand-fed treats, making them mud puddles on hot days to cool off, and learning all about fly control. Every single one of those eggs is precious. I can tell you for a fact, before I had chickens (as an adult), the preciousness of the common chicken egg never crossed my mind. Now it does, daily. Every time I pull a lovely pink or brown or blue or green or speckled egg from the nest box. So for you first timers out there, beware. You’re getting more than your own food source in the backyard. It’s gonna flip you up on your ear. In a good way, of course. If you’re like me, you’ll never look back. Raising chickens is one of the best things I’ve ever done. I’m pretty sure you’re gonna love it too. PS If you’re new at this, here’s a post you might like: 30 Things You Should Know Before You Get Chickens. It will save you some head scratching and panic as you raise these little world-changers in your back yard.